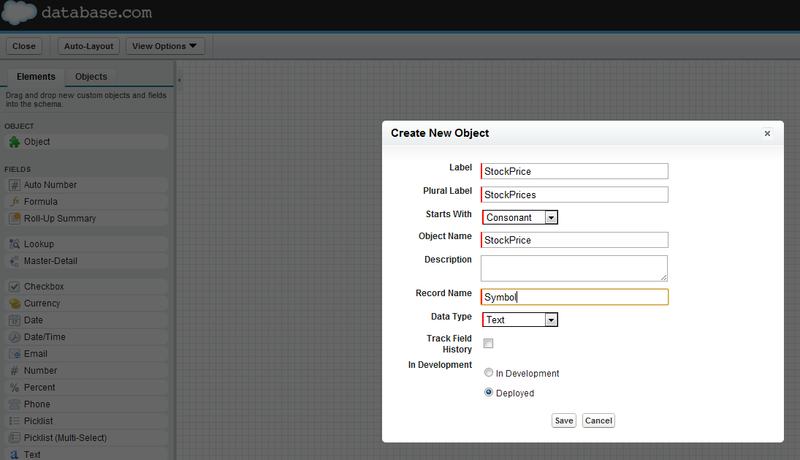 Database.com is Salesforce.com's multitenant Database as a Service platform that aims to be the cloud database engine for application developers. 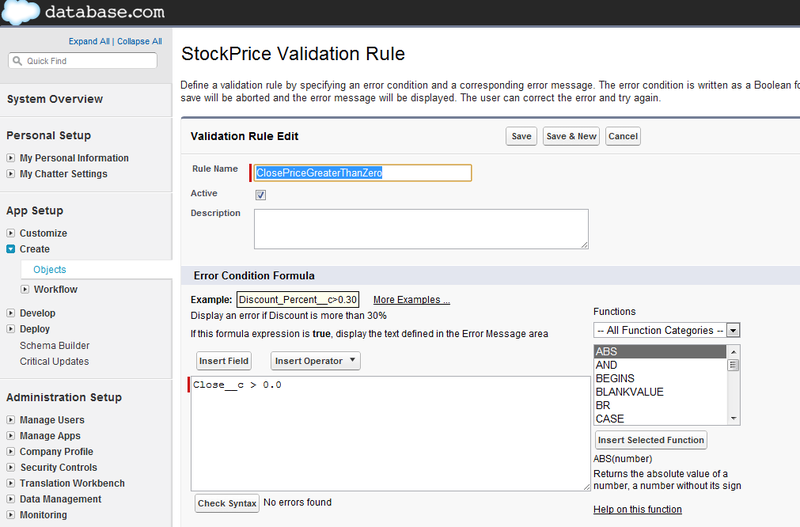 As opposed to Force.com, the Platform as a Service offering from Salesforce.com, it does not support user interface elements such as page layouts or custom views, there is no support for VisualForce, it has no Visual Workflows capabilities and there are no reports and dashboards available. Database.com is focusing on advanced relational database functionalities and supports Salesforce Object Query Language (SOQL) and Saleforce Object Search Language (SOSL) that proved to be popular in enterprise cloud applications development. Database.com offers a REST API which makes it ideal for mobile and social applications that require data storage with state-of-the-art security model and identity and access management. 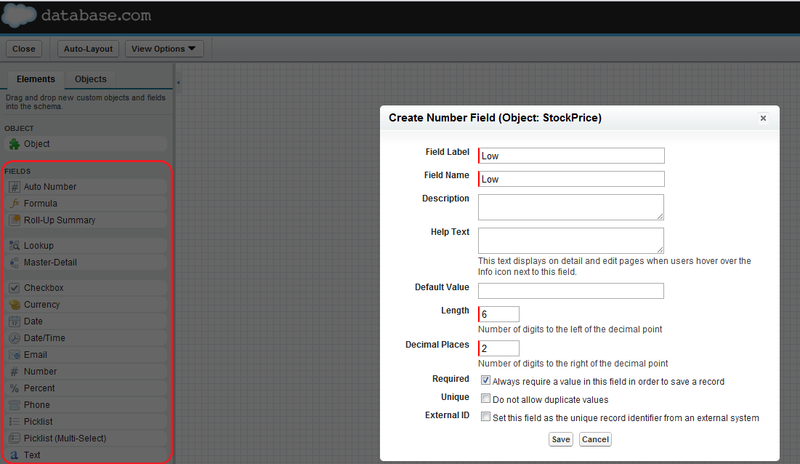 Once the object is created, we can then start defining the fields. 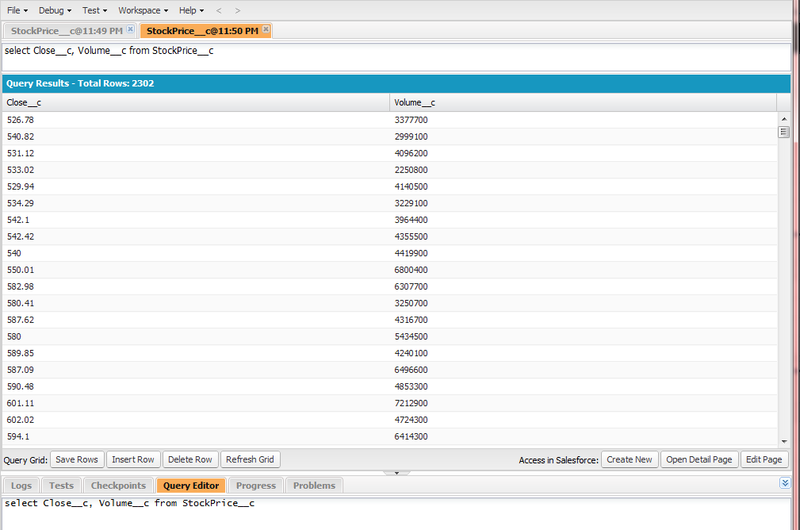 We can use the palette on the left hand side of the Schema Builder and just drag and drop the appropriate data types such as number or date onto the canvas. .
Now, that we have our data loaded into our custom object, the last step is to configure remote access for the remote applications (e.g. 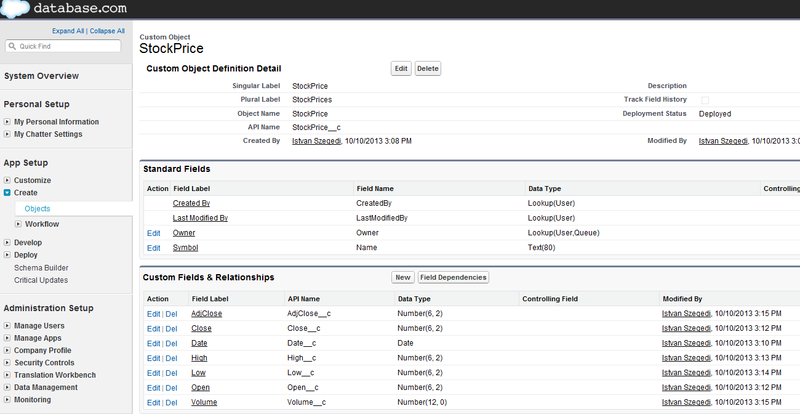 our imaginary mobile applications) who wish to run SOQL queries against our object using REST API. The authentication is based on OAuth standard. 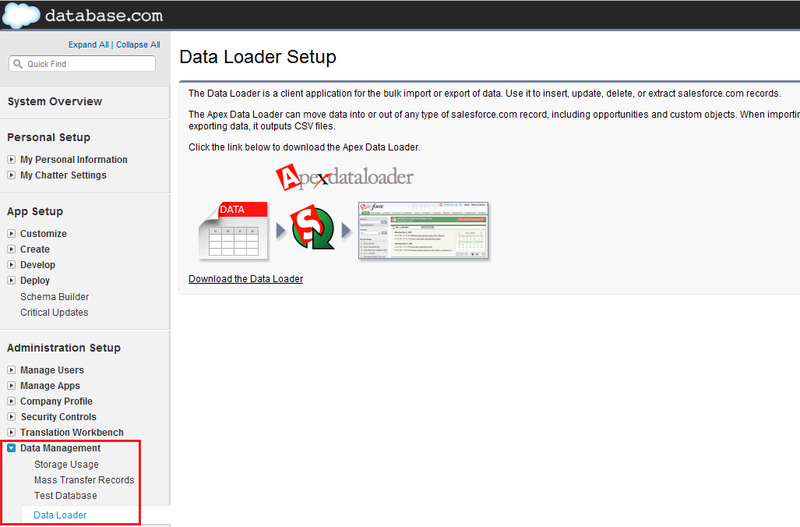 More details about the Database.com authentication concepts can be read here. In order to enable remote access we need to go to Develop->Remote Access menu and configure the required parameters. 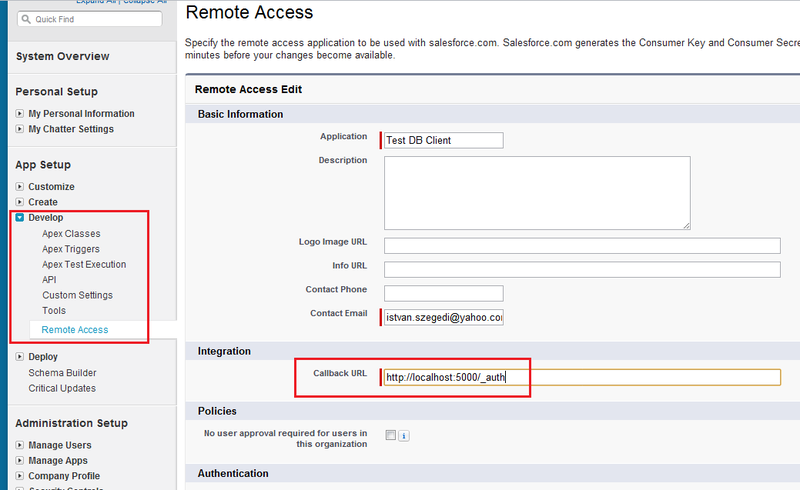 In the Integration section the callback URL is mandatory, in our example we set it to http://localhost:5000/_auth. That is needed for Web Server flow which is the standard authentication method used within the Java template provided by Salesforce.com as a boilerplate application for remote Database.com access. 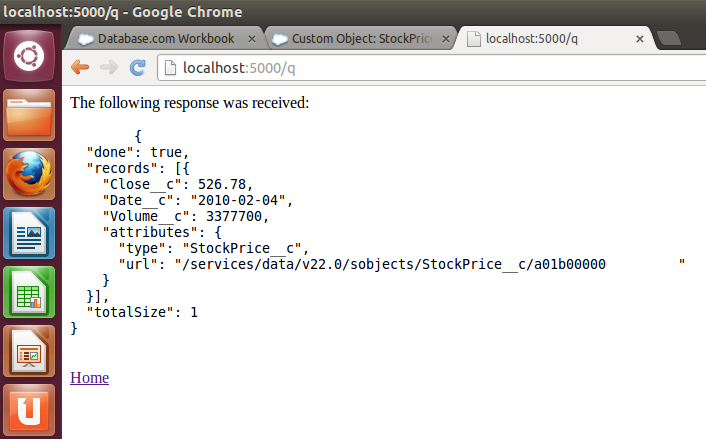 Database.com uses OAuth 2.0 authentication to allow users to securely access data. Various authentication flows are supported such as web server flow, user-agent flow, username-password flow. 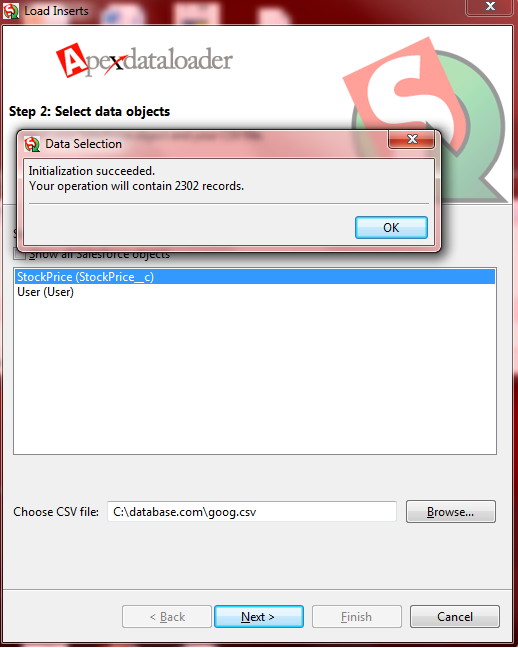 Depending on the actual authentication flow, there are different Database.com endpoints to use. For authorization it is https://login.database.com/services/oauth2/authorize. For token request, the endpoint is https://login.database.com/services/oauth2/token. 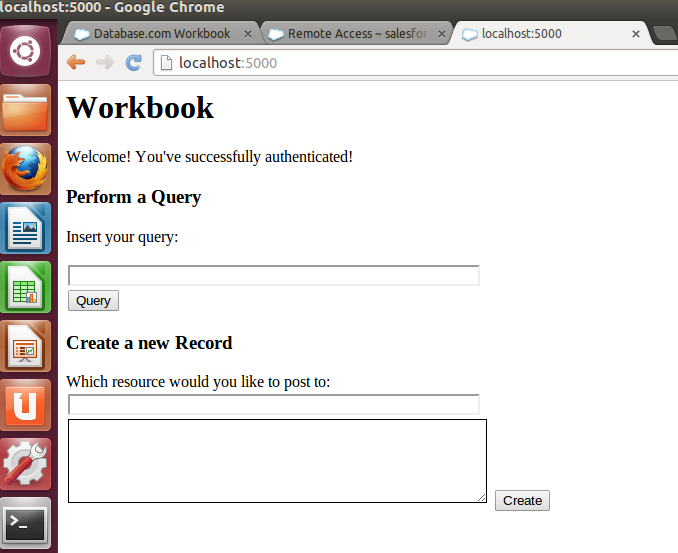 Our first example is based on username-password authentication flow. In this case the user already has credentials (username/password) and it is sent as part of the request, togethr with the customer key and customer secret. The customer key and customer segment can be retrieved from Remote Access, we need to navigate to Developer->Remote Access and select the client. $ curl  https://computing-business-8114.database.com/services/data/v22.0/query/?q=SELECT+Date__c,+Volume__c,+Close__c+from+StockPrice__c+where+Date__c=2010-02-04 --header "Content-Type:application/json" --header "X-PrettyPrint:1" --header "Authorization: OAuth 12345678abcdefgh"